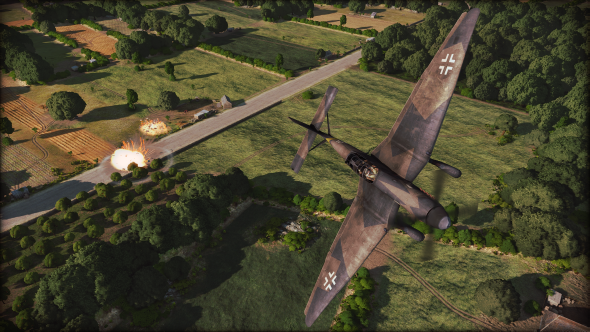 Steel Division: Normandy 44 came out on Steam yesterday. It’s an RTS, but even now I can see your mind filling with all the wrong images: base-building, resource-gathering, perhaps a talented teenage esports star with an enviable rate of actions-per-minute and a lucrative energy drink deal. While it’s possible to string together a sentence that defines Steel Division as a genre-buddy of StarCraft – it’s about drag-selecting a bunch of tiny soldiers and pointing them in the direction of victory – to do so would wilfully misrepresent a brave and oddly beautiful take on the Normandy landings and the struggle that followed. Here are the three most compelling ways Steel Division diverts from the genre it uncomfortably belongs to. Going big has always been an easy sell in real-time strategy, especially as memory limits have begun to disappear from the equation. Scale has been the hook of Total War and Supreme Commander – and more recently, Ashes of the Singularity and Dawn of War III. 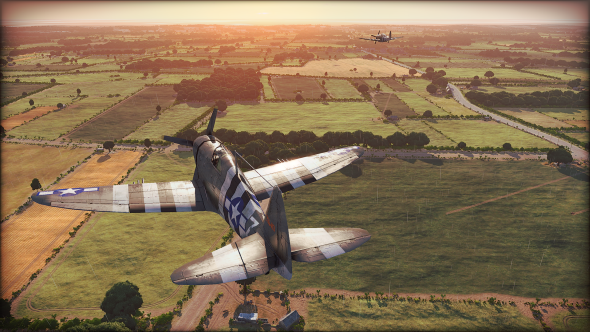 Steel Division’s charmingly named IRISZOOM engine pulls right back by default too, as if you were peeking out the window of a plane, 20 seconds from landing. But the effect isn’t to induce wonder at the colossal chaos of it all. After all, at this distance, your units are reduced to icons trundling slowly across the map. Instead, you’re thinking holistically about the battlefield you can see so much of – seizing crucial ground and setting up makeshift blockades to counter the reinforcements rolling in from the map edge. 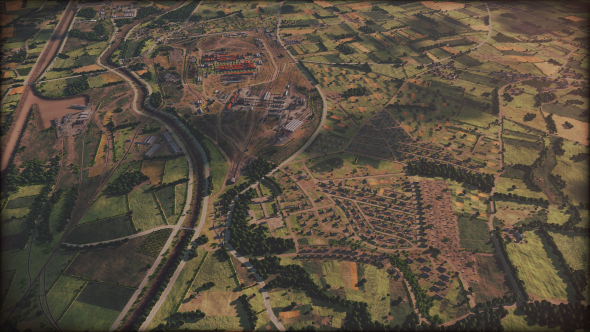 It would be too much to keep track of, if not for developers Eugen’s best trick – the blue and red battle line you can see in the screenshots, which shifts dynamically back and forth across the countryside depending on who’s controlling what territory. When we talk about the map in an RTS, we’re usually referring to an abstraction of a battlefield – an odd, slightly bare square that approximates training (unit queues) defensive structures (arrow towers), and supply lines (tiberium harvesters). To the genre’s credit, the result does feel something like military conflict – but resembles no fight ever fought in our world. You don’t need to know that Eugen designed their maps with one eye on reconnaissance photos from 1944 to know their landscapes look real. Patchwork quilts of green and beige fields, hedgerows, and copses are all sewn together by winding country roads and the occasional river. None of it can be ignored, either – terrain can play a huge part in the outcome of the many skirmishes you’ll fight over the course of an average battle. Obviously, you’ll want to stick your squishiest infantry indoors if you’re holding a crossroads in a village. And if you don’t ensure your reinforcements use the roads rather than roll their trucks through crops, they might not make it to the frontline in time to unload and bring their arms to bear. In Steel Division, winning is a matter of control – and to control any part of its terrain, you’ll have to pay attention to the background. Anybody remember Shadow of the Horned Rat? This ‘90s Warhammer RTS was rendered somewhat obsolete by the existence of Total Warhammer, except in one aspect – a persistent unit roster that carries its losses between battles. In that respect, Steel Division is Horned Rat’s successor. Each of Eugen’s three campaigns – British, German, and American – are made up of several missions in which players call on the same pool of troops each time. If you lose your artillery to light tanks in an early scrap, they won’t be joining you to help flush out embedded infantry in the next. That doesn’t mean you’ll be fighting each battle with the same composition: every fight is made up of three phases, in which you’re only allowed to summon certain kinds of reinforcements based on the historical division you’re playing as. What it does mean is that a pyrrhic victory, of the sort RTS games usually encourage, is no good. If you break your forces against the rocks of northern France, you’ll have nothing left with which to push onward through Normandy. And you’ll want to push on. 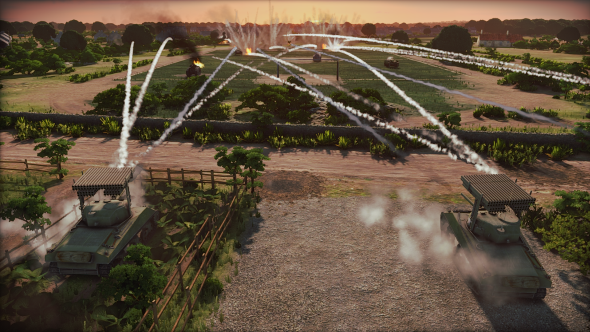 Eugen come from a background in niche wargames – but what’s striking about Steel Division is how you come to understand it over the course of your first battle, and just how much of its nuance is communicated through those tragically picturesque French fields. You can find Steel Division on Steam.